Although machine quilting is taking most of my sewing time, I did manage to get the first border on New York Beauty yesterday. I think that the borders will jazz up this quilt. Next is a pieced middle border of triangles, then an outer border of a coordinating fabric. I hope to start sewing them on Wednesday. 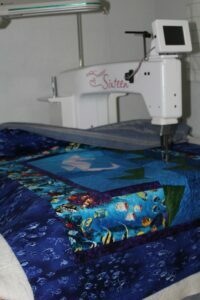 Last week I was busy machine quilting the Butterfly quilt. It is now completed and I am stitching down the binding in the evenings. The Butterfly quilt top was made in 2012 and is more than ready to be a finished quilt. Today was spent machine quilting the Seahorse in Seaweed top. 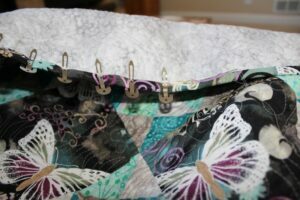 Since I took this picture, I have finished the quilting and stitched the binding. Tomorrow is Presleyday, so I think I should have some time to do handwork. I can tell that my machine quilting is getting smoother with each top I do. 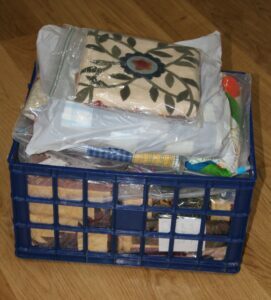 Here is a crate of quilt tops that I want to get quilted this year. Confession time – this isn’t all the quilt tops that I have, just a nice pile to meet my goal of 25 finished quilts this year. 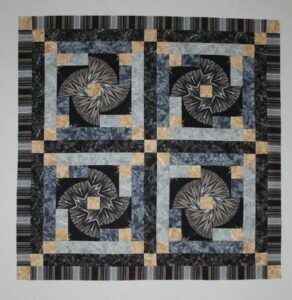 I am on a roll right now with the machine quilting, but it doesn’t help that I keep finding quilts on the Internet that I want to make. However I am resisting the impulse to start a new piecing project. You are making great headway toward your goal! Practice makes perfect, or so I’ve been told. Well I don’t think that I am anywhere near perfect, but I feel like I am getting better especially at picking out designs and thread color. It feels good to get some of these tops into finished quilts.